It’s getting a little crazy now. Just three days ago, we reported that Manchester City had been linked with half of AS Monaco’s outfield team if you count the failed attempt to sign Kylian Mbappé last summer. As of today, City have now been linked with five Monaco players in the past week or so. Add in Mbappé again and that makes it six of Monaco’s stars to have been linked with a switch to the Etihad Stadium. After Mbappé, Fabinho, Tiémoué Bakayoko, Djibril Sidibé and Thomas Lemar, Pep Guardiola now apparently wants the principality side’s left-back. According to ESPN FC sources, 22-year-old Benjamin Mendy is on Pep’s wanted list, with a left-back almost certain to arrive next summer. With Aleksandar Kolarov now favoured as a centre-back and Gaël Clichy out of contract in June, and unlikely to get a new deal following poor form this season, a new left-back is an urgent priority. Some City fans have been saying that for quite a few years. 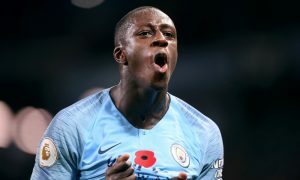 Mendy, who will line up for Monaco against the Blues on Tuesday night, has been scouted regularly by City, ESPN FC report, and with 7 assists in 23 games for the Ligue 1 leaders this season, has shown plenty of ability – like most of the high-flying, free-scoring French side. City fans can watch all of these Monaco players up close on Tuesday night and in mid-March when the sides meet over two legs in the Champions League. Before Tuesday night, don’t be surprised if two or three more Monaco stars are linked. Bernardo Silva, anyone?